ATLANTA, GA (WXIA) – Atlanta Police arrested a juvenile male after chase involving a stolen vehicle Friday afternoon in southwest Atlanta. Investigators said the chase was called into dispatchers at 1:38 p.m., from 2800 Grand Avenue in southwest Atlanta. The chase ended when the stolen black Chrysler PT Cruiser crashed into a home in the 2700 block of Deerwood Drive SW at about 1:45 p.m. When it crashed, the PT Cruiser struck a pipe, causing a gas leak. The home was evacuated, and repair crews from Atlanta Gas Light were called to repair the leak. The suspect, identified as a juvenile black male, received minor injuries and was treated at the scene by EMTs from Grady. No one inside the home was reported injured. ATLANTA -- Red Cross is responding after an apartment fire in southwest Atlanta that displaced 32 people. Officials with the Red Cross Disaster Action Team said nine units were impacted by the fire at Allen Hills Apartments in the 3100 block of Reeves Circle. ATLANTA — Police are investigating, after two people were shot in southwest Atlanta. The shootings happened on Dewey Street around 4:30 Saturday morning. Investigators say one of the men, a 54-year-old man, was found alive after he was shot in the face by an unknown person. During the incident, another man was shot in the leg, but left the location and has not been found by police yet. There is no description of the shooter at this time. Witnesses at the scene say there was a dispute leading up to the gunfire. The investigation is still ongoing and police have not released updates on either of the shooting victims. ATLANTA -- A child is safe after a car theft in Atlanta, late Friday night. The incident happened in the 2600 block of Metropolitan Pkwy. SW. There, police said they arrived to the scene where a vehicle was left running and the perpetrators apparently took full advantage. The suspects drove off with a child in the back seat before ditching the car at a Kroger near intersection of Cleveland Avenue and Metropolitan Pkwy. A police spokesperson said the child was found unharmed. In fact, the child was asleep when emergency personnel arrived. At this point, police are turning their attention to a search for suspects. ATLANTA -- A MARTA bus was involved in a fatal crash involving a pickup truck in southwest Atlanta on Wednesday. The wreck happened on Cascade Road and Spring Park Drive just before 1 a.m.
A person in the truck was killed in accident, according to police. There were immediate reports of major injuries to anyone on the bus. The driver and four passengers were taken to the hospital as a precaution, official said. Refresh often for the latest updates from 11Alive. PHOTOS: MARTA bus crash on Cascade Rd. 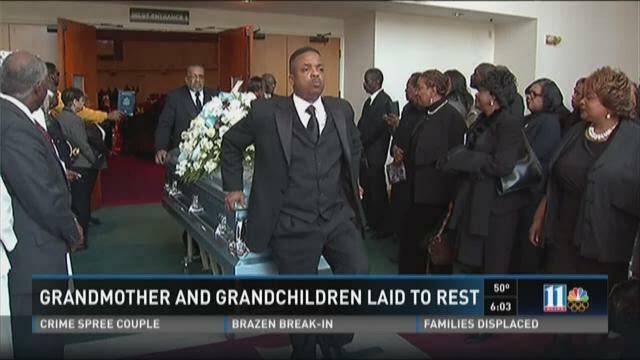 ATLANTA -- A local community said goodbye to a grandmother and her two grandchildren, Saturday. ATLANTA -- The owner of a dry cleaner business in southwest Atlanta is in the middle of a firestorm of criticism after he was caught in a race-fueled rant on camera. The exchange happened at the Ben Hill Custom Cleaners on Fairburn Road. "You shouldn't be prejudice in black neighborhoods," said Andy Foster who was recording the video, "you [expletive] are more racist than anybody," said store owner Amin Chaudry in the video. Video of the incident between the store owner and the black customer has spread like wildfire online. At one point in time, Chaudry tells Foster to "send it to Obama."